Great places are not built. With plans for a boutique hotel, a rooftop bar, loft offices and more, our goal is to transform the site of the long dormant Hoster Brewing Company while keeping its history and architectural beauty on full display. We hope for these magnificent buildings to serve as a vibrant gateway into the Brewery District from downtown Columbus and the west. Note: the program for this project has changed since the creation of this video, which was created by Schooley Caldwell as part of the design competition for the redevelopment of 477 S. Front Street. While our design philosophy and overall goals for the site remain the same, the specific renderings and plans presented in this video no longer accurately reflect the current design which has evolved considerably. Schooley Caldwell's vision for the former Wasserstrom/Hoster Brewery Complex at 477 S. Front Street is to create a neighborhood that harmonizes the past with the present: a hub of activity that will bolster the surrounding bars, restaurants and stores with many new residents and out-of-town visitors. Dark, abandoned portions of the former Hoster Brewery complex (intentionally built to keep sunlight away from beer) will be opened and expanded. Paved lots and alleys will become comfortable urban spaces to stroll and sit in. In phase one of this project, Schooely Caldwell proposes to create an anchor to the Brewery District. Our design includes renovation and new construction, yielding a new boutique hotel, loft offices, retail, and restaurants. This combination of programming adds density and activity and will enliven the site and neighborhood from morning to evening. A stunning boutique hotel will draw a diversity of visitors to the area while infusing it with activity and energy at all hours of the day. Loft offices will have a unique appeal to expanding markets and businesses. Various shops lining Front Street will create an active, pedestrian-friendly zone and achieve maximum visibility and accessibility. Restaurants and a new brewery will pay homage to the history of this site&mdash;the former home of the Hoster Brewing Company. With incredible views of the Brewery District and downtown Columbus, an addition along Front Street will feature several rooftop amenities, including a bar and a pool. There will be ample space for events, including a speakeasy with views of downtown and a grand, top floor ballroom overlooking Ludlow Alley. The L. Hoster & Sons Brewery was founded in 1836 and was located just south of the The Block at Hoster. It started as a small operation and produced just 300 barrels of ale a year. As the city grew and changed, so did the brewery. By the 1850s the brewery was producing 1,600 barrels of beer a year. The change from ale to beer was a reflection of the increased number of German immigrants and their preference for beer over English ale. From the 1870s to early 1900s the brewery experienced a period of rapid growth and change. During this period the plant was constantly being rebuilt and enlarged and went from producing 8,000 barrels a year to 300,000 barrels a year. 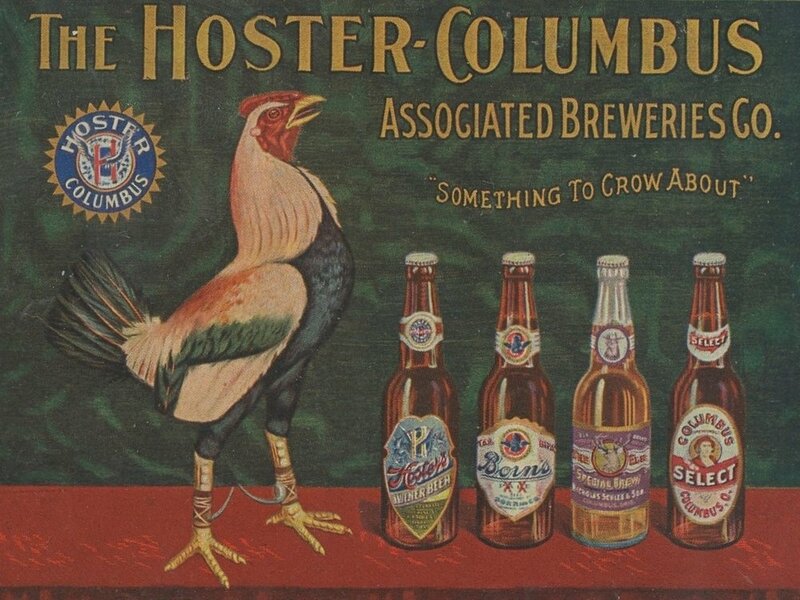 Shortly after the turn of the 20th century, Hoster merged with the three other large breweries in Columbus to form Hoster-Columbus Associated Breweries Company in 1904. Although they briefly dominated the central Ohio market, producing more than 470,000 barrels a year, changing attitudes toward prohibition greatly impacted business. By 1914 they werFe producing just 225,000 barrels a year and the company went into receivership. The company was reorganized in 1915 and continued to operate under changing regulations until Ohio went completely dry in 1919. In 1920 all brewery and beverage operations ceased. After 1920, much of the complex was purchased by rival brewery Wagner though it was not used for brewing beer. Over the following 90 years the buildings have been occupied by a variety of businesses ranging from warehouses, rug weaving, a chair factory, bag and burlap cleaning, paper box factory, ice making, printing companies, a haunted house, Wasserstrom’s furniture and equipment showrooms and eventually offices. This is a chance for the complex to reinvent itself for the next 90 years and beyond! An ad for Hoster beer from the early part of the 20th century. This grand, ornate building along Front Street was torn down decades ago and was replaced by the former Wasserstrom Building. Aerial view of the old Hoster Brewing Company Complex along Front Street.